There is no place in Ontario like Discovery Harbour. Your primary students will never forget their day in the 19th century. This is hands-on learning in a fun, fresh air environment. Your students will discover the life of a sailor, soldier or settler in 19th century Upper Canada. They will learn about the challenges faced by the original naval, military and civilian personnel in a fun, interactive tour. Teachers can customize tours by selecting a theme like "pioneer life", or the "War of 1812". If you would like a theme, please advise us when booking the Discovery Tour. Phone (705)528-7694 or click here to enquire. Students will go back in time to explore life in Upper Canada 200 years ago. What was different and what is the same? Transportation, cooking, toys and games will be explored. Also, your class will have the opportunity to create a 19th century clothes pin soldier or lady they can take home with them. 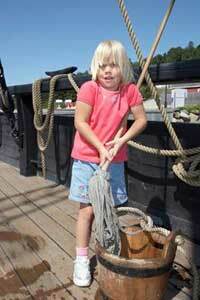 They will also go on board the replica tall ship H.M.S. Tecumseth and see the original hull in the exhibit gallery. This is a fun interactive program which highlights life in Canada, then and now. By Phone at (705) 528-7694, or, click here to enquire.